From 1864 to 1977, trains carried up to 90% of U.S. intercity mail, and RPO cars like this handled enroute sorting, pickup, & delivery. Part of Lot 6086, Spec.1044, Plan 25C-1986 in the 70-79 series and painted Coach green (dark olive, lighter than Pullman green) with yellow lettering, this 128,300 lb. (64.15 ton) steel heavyweight is 60′ 8 1/4″ long, 10′ 1/4″ wide, and 14′ 2 7/16″ high. It has four- wheel, 9′ wheelbase ATSF trucks. New roller bearings replaced its friction journals in the 1950s. It has six barred windows and two sliding doors on each side, and is equipped with electric lighting & screened fans; a manual-control steam heat system; mail sorting counters that can be raised and hooked up; overhead bins; letter- sorting pigeonhole boxes with rotating name “headers”; a safe; and catcher arms outside one door on each side. These were swung out to grab mail pouches suspended from trackside mail cranes without stopping the train, and then swung into the car for pouch removal. 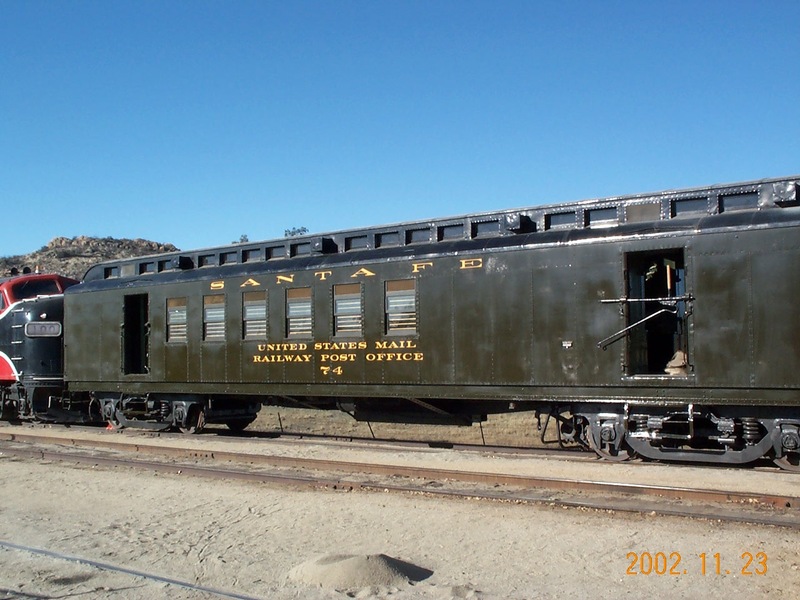 RPO cars were built to government specifications by the railroads, which owned these cars and were paid by U.S. Post Office contracts per mile of running time. They were staffed by specially-trained, armed U.S. Postal Clerks, who referred to their runs by the cities between which they operated: north to south or east to west, with north-south taking precedence. ATSF #74 was often assigned to the Kansas City-Albuquerque run. It was photographed in Los Angeles on November 12th, 1967. Its final runs may have been on the Clovis-Lubbock -Temple-Houston run on Santa Fe’s Panhandle & Santa Fe and Gulf Coast & Santa Fe subsidiaries, as its pigeonhole box headers were set for cities on that route. ATSF #74 was retired in 1968, as the U.S.Post Office transferred its mail contracts to airplanes and trucks (the last RPO run was June 30, 1977). ATSF #74 was sold to Intercontinental Steel for scrap April 9, 1971; then bought for use as a gift shop selling railroad paraphernalia in Houston, TX. Its interior was left mostly intact with an air-conditioner added. Black signboards were placed outside the car’s side doors, and its exterior was painted sky blue with silver roof and yellow letting. After an ad offered ATSF #74 for sale, the SDRM purchased it in December 1989, thanks to an earlier donation by retired RPO clerk & PSRMA Life Member #1 Herbert Kehr and wife Josephine for the acquisition and restoration of an RPO car. Other members and many former RPO clerks also contributed to this fund. The carbody was trucked from Houston to Campo, arriving April 4, 1990. The trucks and wheels, moved free by the Santa Fe and SD&IV, arrived April 16th.